Long long ago, we lived together as tribes. It seemed to work very well until we became civilized and began forming societies which was hierarchical rather than tribal. The Industrial revolution era marked the apogee of this hierarchical civilization as the modern society was built based on its principles. Are we living today in the midst of a fundamental shift ( definitely not evolutionary) where we are returning back to the tribal way, driven by the networked world we are beginning to inhabit? Everybody(including marketers) is talking about communities these days. As the Web broke the cardinal rules of business, bringing the customer back to the epicenter of business, organizations are striving hard to be nimble and humble. Today's business ecosystem behooves leadership of a different breed altogether to address its complex challenges. Behind every successful dot com, the stories we hear are the same. An extremely passionate tribe, driven by a larger-than-life vision which seeks for a better world. An incredible work culture with absolute freedom for employees to choose who their leader would be and what they want to work on. While it looks romantic when seen from outside, what really happens inside? how do they work? What are the levers behind great organizations? 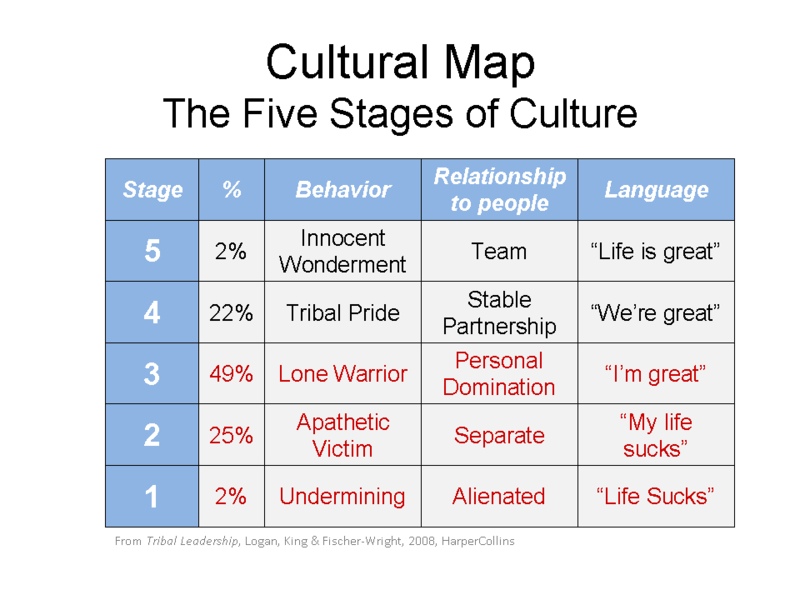 Tribal Leadership by Dave Logan, John King & Halee Fischer-Wright answers these questions convincingly as it takes us through the five tribal stages a company progresses from the lowest stage of survival to miraculous innovations at its apogee. 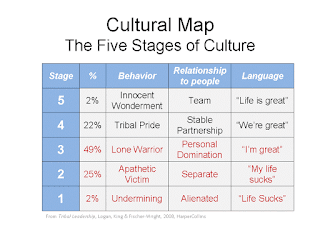 With these five stages being applicable to individuals as well, the book elaborates in detail about each stage and helps us assessing which stage we are currently in based on the language we speak. I personally benefited a lot from this assessment as it made me introspect my behavior and actions to understand my leadership predicament. Is it possible to lead someone without the baggage of being led? I had raised this question earlier, as I talked of the need to jettison the traditional super-human archetype of leadership. While it is easier said than done, the critical shift happens only when the epiphany dawns that the individual is incapable of winning alone. As I introspect over my actions and behavior, I realize I am yet to come to terms with this shift. Among various coaching tips given by the authors to facilitate this shift, the one which stood out for me was to change in focus from time management to space management. While it is quite common for talented achievers within teams to complain about less time, while they try to bite more than they can chew, the perspective is completely shifted to a different plane, when the attention forces to find a solution through managing space between people. Triading concept is one of the biggest strengths of this book. It was one of my biggest take-away from this book as it made me rethink how I created business relationships. With a treasure trove of anecdotes and examples across diverse industries, the book showcases how tribal leaders use triads to forge relationships, foster innovation and also resolve conflicts in their teams. The research behind the book draws extensively from the works of Ken Wilber, Dan Beck and other leading thinkers in systems theory and development. I am personally intrigued by Dan Beck's Spiral Dynamics and its applications in organization development. I would be checking them out soon. Although the book delves into necessary technicalities to enable us understand the intricacies behind networks, you never get lost in them! A wonderful read for anyone who is keen to understand how organizations ought to be built in the networked world. Disclaimer: I received an advance copy of the book from the publisher with no charges. I've taken enough care to ensure that this hasn't influenced my judgement about the book. It’s wonderful information all the things to explain very clearly. I get it some new information through this blog.